This tale is in two parts: First the party. Coming up next, the odd way in which I came to be there. Ethelsville, Alabama is a town in Pickens County with a population of about 80 people, 3 miles from the Mississippi state line. The Griffin family constitutes about ten percent of that number, and they have this party every year, but this was the first year I’ve attended. The Griffin’s farmhouse where the party took place was a little off the road, so I didn’t see it at first. Finally I noticed the long dirt driveway, and when I followed it a little way, I saw the cars. And the fire. This, however, was only the little fire. Just a little campfire for people to stand around and be warm while they smoked cigarettes. The real fire would come later. I walked in and said hello, and then I delivered my chocolate pecan pie to be entered in the pie contest. 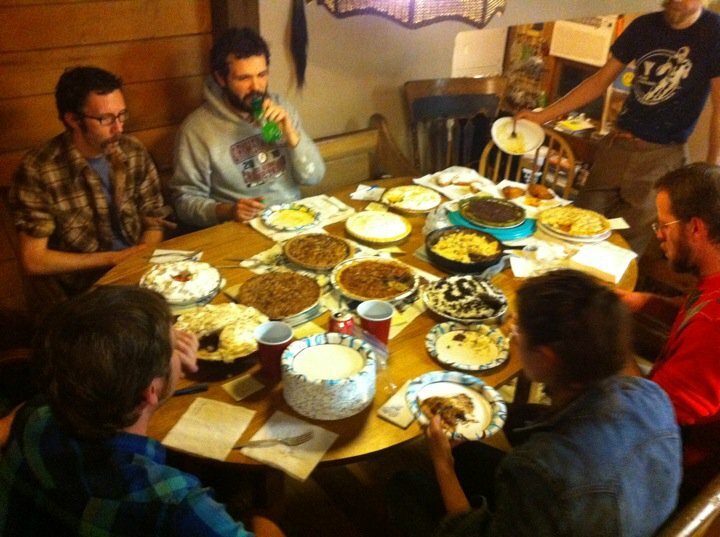 The contest is a tradition, but it isn’t always pie. (update later with examples of previous years’ contests). The evening started off very casual and mellow. I joined some friends sitting on the floor for a card game. Soon the pie judging began. There were six judges and a complex scoring system that I never quite got the gist of. Two categories: sweet pies and savory pies. I did not win. Two pies that tied for first in the sweet category were a blueberry pecan pie baked in an earth oven and some sort of strawberry kiwi thing that completely frightened me, but I’ll take peoples’ word that it was good enough to win. The winning savory pie was a sausage and feta pie. 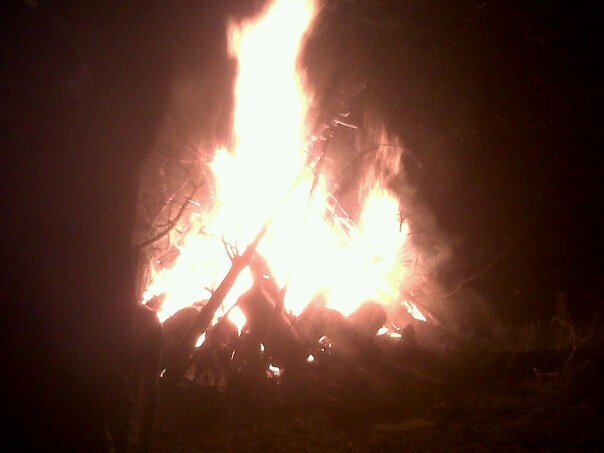 After the judgment was announced, it was time to start the bonfire. Now, you should know that there were lightning storms off and on throughout the night, and at the particular time that it was decided to start the bonfire, it was raining rather heavily. However, this did not hinder the fire. 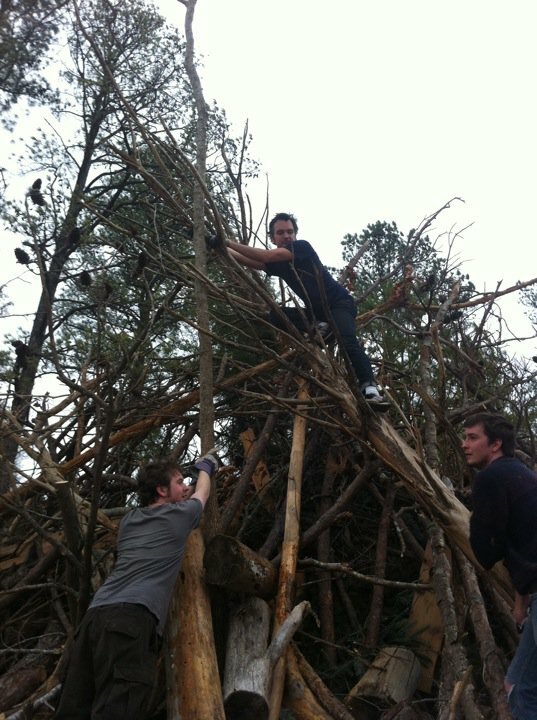 Below is a picture from earlier in the day when the bonfire was being constructed. They had bought a number of unsold Christmas trees from a lot to use as kindling, and I think there was a fair amount of kerosene involved as well. No amount of rain was going to prevent this bonfire from happening. As it turned out, a few minutes after it started, the rain let up for a while. But the downpour continued in waves. At one point there were a dozen of us huddled under a plastic tarp, and we shuffled the entire group like a Chinese dragon from one side of the fire to the other so the person on the end could get another beer. The fire was spectacular, and I wish I had a better picture to properly demonstrate the scale of this thing, and perhaps some will be uploaded to the internets later. But here is a crappy picture taken with my cell phone. What you can’t see are all of the other little fires, Swedish log candles, that were lighting the pathway from the house to the bonfire. It was truly a spectacle, and the fire works had not yet even begun. About a half an hour before midnight, began the tradition known as the burning cauldron of death. 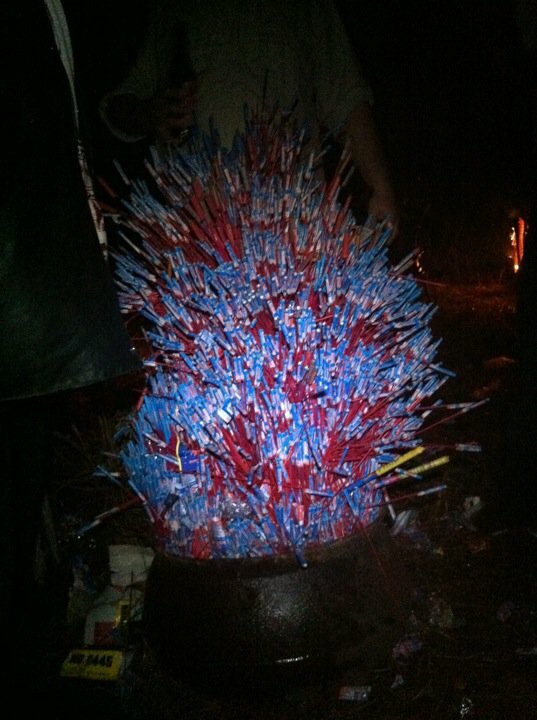 This was a cast iron cauldron, filled about three feet above the brim with bottle rockets, whistlers and Roman candles. Then kerosene was poured down a hole in the middle, and the cauldron was hoisted on top of a tree stump pedestal, four or five feet above the ground. This is what it looked like before it was lit. It took several minutes for all of the fireworks to go off, and a fire continued to burn in the cauldron for at least an hour. The stump pedestal was also on fire. This is how we party down here. After the fireworks, we returned to the house, where Mrs. Griffin had made dozens of petite sandwiches that had been doused with some sort of delicious marinade and then baked. They were delightful. After eating several of those, I fell asleep on a sofa, but as I understand it, there was some sort of hot tub activity going on while I slept. I woke up this morning to Mr. Griffin and one of the sons making black eyed peas, ham, and barley for breakfast/lunch. It was an awesome, awesome party, and I can’t thank the Griffins enough for their hospitality. I think that if I’m within 200 miles of Pickens County on any future New Years Eve, I will have to go back. Next… the strange circumstances that brought me to Ethelsville. This entry was posted in The South on January 1, 2011 by mdavidhornbuckle.